The RMS Titanic was a passenger liner that struck an iceberg on her maiden voyage from Southampton, England, to New York City, and sank on 15 April 1912, resulting in the deaths of 1,517 people in one of the deadliest peacetime maritime disasters in history. 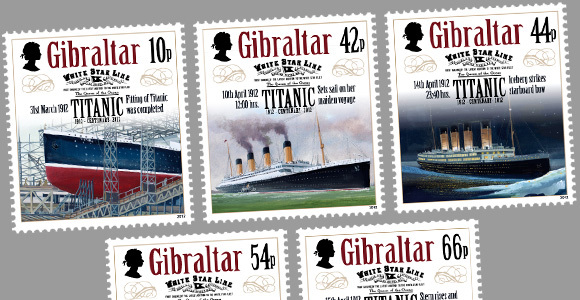 The largest passenger steamship in the world at the time, the Olympic-class Royal Mail Ship RMS Titanic was owned by the White Star Line and constructed at the Harland and Wolff shipyard in Belfast, Ireland, UK. After setting sail for New York City on 10 April 1912 with 2,223 people on board, she hit an iceberg four days into the crossing, at 11:40 pm on 14 April 1912, and sank at 2:20 am on the morning of 15 April. The high casualty rate resulting from the sinking was due in part to the fact that, although complying with the regulations of the time, the ship carried lifeboats for only 1,178 people. A disproportionate number of men died due to the "women and children first" protocol that was enforced by the ship's crew.